Hi everyone! I've been meaning to blog about this for a while, but I've been rushing to complete a few tasks that I had on hand. Today I want to share with you my experience receiving a bag of rotten frozen drummets (yuck!) from Tesco Home Delivery AND how I got a replacement for them. I've blogged about using Tesco's Home Delivery service before, which is absolutely heaven-sent for me because trips to the supermarket are tough with Arif's autism and sensory sensitivities. But once in a while, a slip-up will happen, but thankfully they have a pretty good customer service team on hand to help customers. 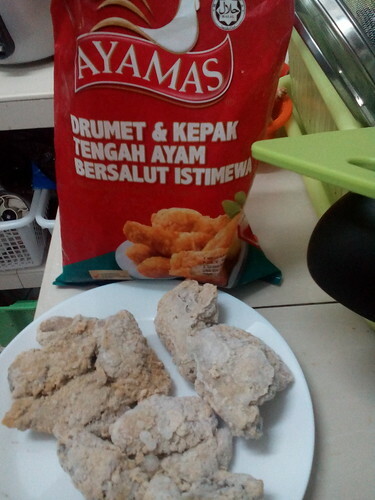 I had ordered a bag of Ayamas frozen Drummets along with my other groceries and was going to make some for dinner, but when I opened the bag, I was greeted with an unpleasant smell. No doubt the drummets had gone off. They were clumped together like they had thawed and refroze. There were black spots on the drummets too. 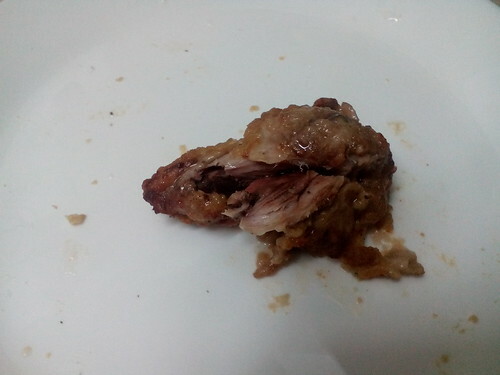 I fried one in my air fryer and it turned out horrible. Just the smell alone made me gag. So the next day, I PM'd Tesco Malaysia's FB page. They replied and said it is against their policy to offer reimbursement for frozen foods, but that I should call their customer service centre and explain. So that's what I did. I called them up and told them my situation. The lady on the line called up the Tesco branch in Puchong, which is responsible for delivering my groceries. They said they would give me a replacement. But how they would replace the drummets was not made very clear. The lady on the line said that if there was a delivery in my area, they would drop off the drummets. And so I waited, but no drummets came. A week passed and then Chinese New Year came. After the festive season, I needed to order groceries again, so I made a remark at the end of my online order for them to send my drummet replacement along with my other groceries. Alas, my groceries arrived, but no replacement drummets. I was a little miffed, because all this while I had to keep the bag of rotten drummets in my freezer, so that I could return it to Tesco as proof. It was taking up precious room.The delivery guy explained that when I make my next order, I must call customer service and remind them. In about a week, the time came for me to order groceries yet again. After making my order, I promptly called Tesco Customer Service. I gave them my old order number and the new order number. They took note of the item that needed replacing. The next day, my order came and this time, with my drummets! Yay! And I was finally able to give them back that awful bag. When I received my new drummets, I quickly opened the bag and checked. I didn't want to get another rotten bag. I think this is what I'll do from now on to save me the hassle of calling CS and waiting. I recommend you do the same if you get frozen foods via Tesco delivery. All in all, it was a happy ending :) Thanks Tesco for the help!